The websites author and copyright owner is Hipica can janot siurana figueres girona pupil·latge cavalls pupilage caballos natural paddoks semillibertat excursions cavall pension cheval. The web server used by Canjanot.net is located in Spain and run by arsys.es. 30 other websites are located on this web server. Most of them are provided in the spanish language. 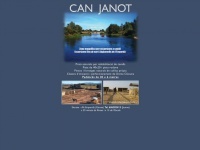 The websites of Canjanot.net are hosted by a Apache server and were developed in the programming language PHP. The markup language of the website is XHTML 1.0 Transitional. Both the inclusion of the website in search engines and follwoing of its hyperlinks is explicitly allowed.